I'm typically not the biggest fan of OPI, crazy I know! I saw a mini set of the OPI Brights at my local Sally's and they spoke to me, I had to have them! Hotter Than You Pink is a pink shimmer. No issues. 2 coats. Can't Hear Myself Pink! is a pink foil shimmer. This one was hard to build up. 3 coats. Down to the Core-al is a coral shimmer. No issues. 2 coats. Life Gave Me Lemons is a yellowish green creme. Formula was a bit streaky even after 2 coats. 3 coats. I Sea You Wear OPI is a blue foil shimmer. I still had bald patches after 2 coats. This is 3 coats. My Car Has Navy-Gation is a navy blue creme. No Issues. 3 coats. 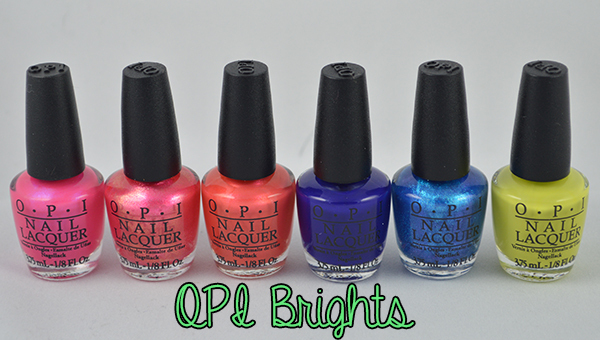 Do you have any OPI Brights?